A stars life cycle is similar to a humans life cycle because there is birth, aging, and death. A protostar is a contracting mass of gas that represents an early stage in the formation of a star. A protostar will need to achieve and maintain equilibrium. Equilibrium is a state in which opposing forces or influences are balanced. 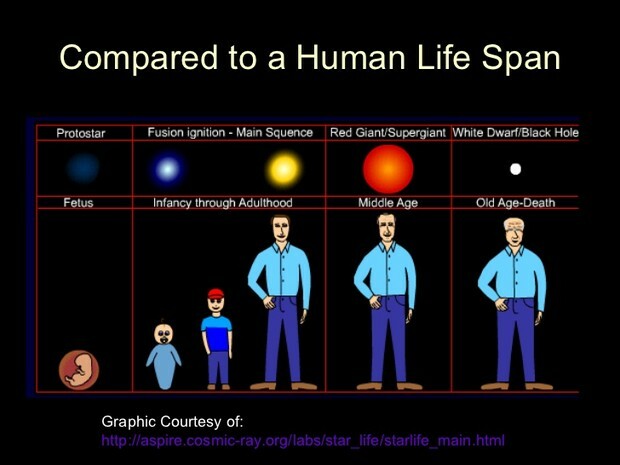 Stars live out the majority of their lives in the Main Sequence. Once the star achieves nuclear fusion stars radiate energy. Nuclear fusion is a reaction in which atomic nuclei of low atomic number fuse to form a heavier nucleus. A red giant is a large, bright star with low surface temperature. This is one of the lasts stages of a star when no hydrogen remains in the core. After the Red Giant phase a star must eventually run out of fuel and collapse, regardless of its size.